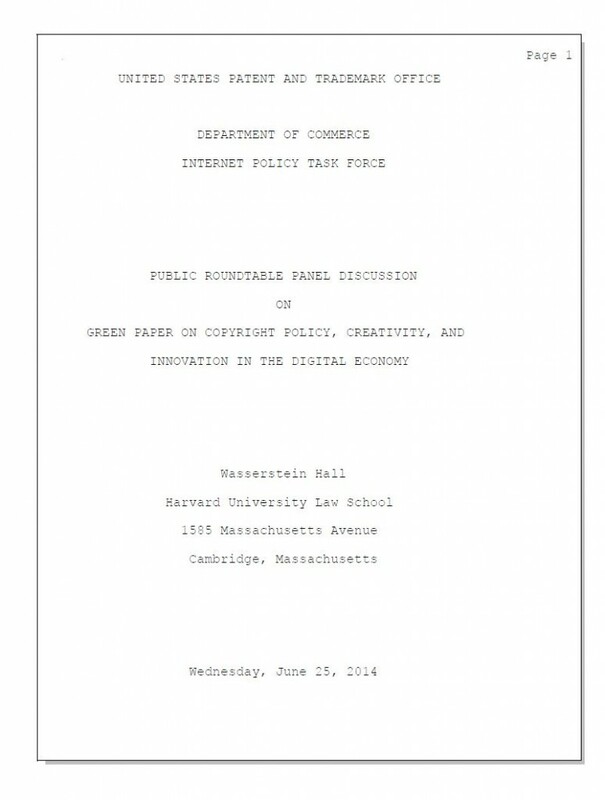 And so it was that, as previously blogged, on June 25, 2014, I participating in the copyright statutory damages segment of the PTO’ / Department of Commerce / Internet Policy Task Force public roundtable discussion “Green Paper Roundtable” in Cambridge, Massachusetts. It was great fun. I learned a lot. I made some new friends. No, really. And now you can read the transcript — click on the pic (or, all right, here). [BEN] GOLANT [Attorney Advisor, USPTO]: Let’s get started with a question on individual file sharers, and it goes like this. Should individuals who are engaged in file sharing on a personal level with no profit-making motive or commercial element be treated differently than other entities for infringement award purposes? Why or why not? And as we did before, put up your tags, and we’ll call on you in order. So let’s see. Ron, and then David, and then George, and then Jodie. Go right ahead. MR. COLEMAN: My view is that they should be treated differently. They should be treated in concert with the purpose of statutory damages, which is to provide a disincentive, which may very well be out of proportion to the actual damages suffered. We understand that works that are created by people who frequently don’t have resources to enforce their rights in copyright ought to be protected, and that’s the purpose of statutory damages as well as the attorneys’ fee provision of the Copyright Act. On the other hand, it’s one thing to say that a college student is being treated in a – by having an award levied on him or her that is disproportionate to the damage to the copyright holder, in the case of a file sharing of music, for example, by imposing a tenfold, a hundredfold factor for file sharing. It’s another thing to say that someone should be put in the position of owing a nondischargeable judgment debt of hundreds of thousands of dollars, perhaps even millions of dollars, for personal file sharing. If indeed it is the case that we’re talking about a person who is not part of some ring, part of some conspiracy to circumvent the Copyright Act, you can get a lot of bang for your buck and send a very strong message without ruining people’s lives for file sharing. MR. GOLANT: [W] hat kind of factors should the courts examine in the context of individual file sharers? And in particular, perhaps, should the courts consider [ability] to pay as a consideration …? MR. COLEMAN: I do have a couple [of] thoughts. I think it answers your question; it also addresses a point that George brought up, incidentally. You say what factors do courts consider, and the thing about statutory damages cases is, you can find cases that say that they should – because there is a punitive aspect of statutory damages, therefore courts should consider or instruct juries to consider the ability to pay, because what’s punitive for me and what’s punitive for some very wealthy person or some very poor person are three different things. I think it might be worth taking a step back and asking ourselves, why are juries making these decisions? If anyone has ever tried a jury case involving intellectual property, the damages tend to be very often hard to assess. I’m talking about actual damages. Statutory damages is weird. When you first encounter it, you think, well, it’s punitive; it has all these equitable aspects to it. Why are juries the ones that are making these sort of what we would generally in litigation associate with judicial-type decisions regarding equity, regarding penalties? Now, of course, juries do make verdicts in terms of punitive damages in other contexts; I recognize that. I think that’s a question that’s worth asking. . . .
MR. COLEMAN: We may be making a mistake focusing too much — we have the benefit of having George [Borkowski of the RIAA] here, so it’s so tempting — on enforcement of file-sharing cases. I’ve been involved in a couple of [other] cases, tangentially or otherwise, and if I say the word “Righthaven,” then I think everyone is going to know exactly what I’m talking about. Short of the well-heeled law firm and a deep-pocketed plaintiff, there’s an entire industry, a business model that has sprung up premised on generating profits from the threat — and George makes a good point; there are [only] two well-known cases involving big file-sharing verdicts [– b]ut outside of file sharing, there have been very substantial six-figure judgments that have either not been appealed or that have been upheld on appeal that involve minimal or disproportionate damages. And again, the whole Righthaven industry, the copyright trolling industry, was premised on this idea that you can use essentially a cookie cutter sort of  complaint, minimal investment up front, you send people letters saying that as you know, your potential liability is in the high six or seven figures. And they were called out in the District of Nevada, but in other places [–] I’m representing Sarah Palin in a case involving her use of the famous 9/11 photograph, the rights of which are owned by a New Jersey newspaper company. One of her people used it as a thumbnail on Facebook. It was probably online for all of 24 hours. And they’re seeking . . . what can only be identified as windfall damages. And that’s the other side of the deep-pockets argument, which is that because my client happens to have relatively deep pockets, you’ve got plaintiff’s lawyers that work on a contingency and for whom it’s worth pursuing because even if there’s a one-out-of-three chance of their succeeding, their upside far outstrips [the risk. [S]o there’s a distortion there that the statutory damages regime, as it exists now, is clearly giving us. [JAY] ROSENTHAL, National Music Publishers Association]: She’s not your normal infringer, though. She’s a little special. MR. COLEMAN: Well, but the fact is, she’s not [–] in many ways she stands in for a lot of people who are less famous and who are less able to work out a deal with me to get the representation that would be appropriate. If you got this far, you probably care enough to read the whole thing. There is very good stuff in there — very smart people! FUN FACT: During one of the morning panels the Supreme Court’s decision in Aereo came down. Everyone in the audience, who of course was plugged in, new this, and we were all wondering whether to interrupt the panelists, burst into song or whatever. [ANN] CHAITOVITZ, Attorney Advisor, USPTO]: Thank you. I was being flashed our time limit. So we now have ten minutes for people to make their comments, respond to any of the questions asked or issues discussed. We have two microphones here, and there is a way to do it online. The site is right next to the site for the Web link on the PTO — on the copyright page of the PTO site. MS. CHAITOVITZ: Wow; we didn’t even — too early? Are you guys still sleeping? MR. ROSENTHAL: No emails from Girl Talk? FROM THE AUDIENCE: Supreme Court reversed, 6 to 3, in Aereo, an opinion by Justice Breyer. FROM THE AUDIENCE: Nothing else matters. MR. COLEMAN: We all know the really bad actors when we see them: LimeWire, Napster. It was obvious; right? 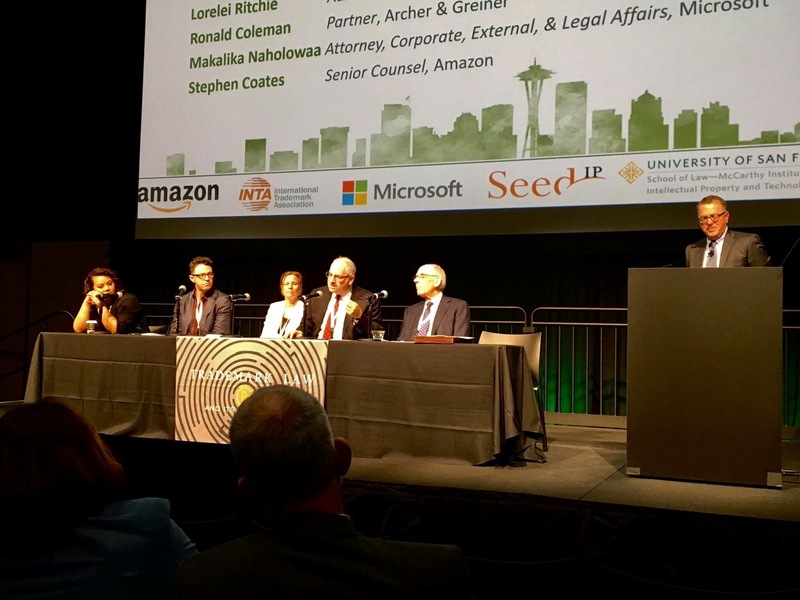 But somehow in the case of Aereo, the Second Circuit, the United States Court of Appeals for the Second Circuit, thought what they were doing was legal, as did obviously the lawyers they hired to advise them before investments of a probably pretty massive scale. Circuit bought it. And a number of Supreme Court Justices bought it, too. Well, easy come, easy go; right? I wonder whether the statute – unspoken premise here: Businesses that, like Aereo – I mean, if in fact it turns out that Aereo was an infringer, which apparently it does, there’s going to be a lot of stuff. They’re out of business; right? We understand; they’re out of business. Statutory damages, [what we have] to decide[:] is that a very rational, societally speaking, policy-wise way to come to conclusions about innovative technologies? Because federal courts will not issue advisory decisions. So you can’t — and besides, if you’d gone to a district court, and even this Court of Appeals, you’d think you’d have something going for you; right? That’s a question I think that statutory damages is not so great an answer for us. The idea that, as George said, we’re slamming — you know, innovation is not infringement. Well, innovation wasn’t infringement for Aereo until this morning. MR. BORKOWSKI: I’m also tempted to talk about the Aereo opinion; it’s very exciting. But Aereo was not innovation. Every commentator, every court, including the Supreme Court, recognized it was not innovation. It was this elaborate, ridiculous, as you said, attempt to work around the transmit clause of the Copyright Act; and I thought it was absurd from the very beginning. I was proved right this morning. But Aereo has nothing to do with statutory damages; it really doesn’t. It is a case that was brought to stop infringement, and get an injunction to stop infringement. That’s the primary purpose of that case, even though I don’t represent the plaintiffs in that case. But that really was the harm that was being caused. I really don’t see how statutory damages works in this whole Aereo thing. Aereo would have done what it did regardless of whether there were statutory damages. Well, it did. It tried to, quote-unquote, innovate, and you have these statutory damage awards, and so it was not hindered in any way, in terms of attempting to do what it failed to do. Yep. I let George have the last word.